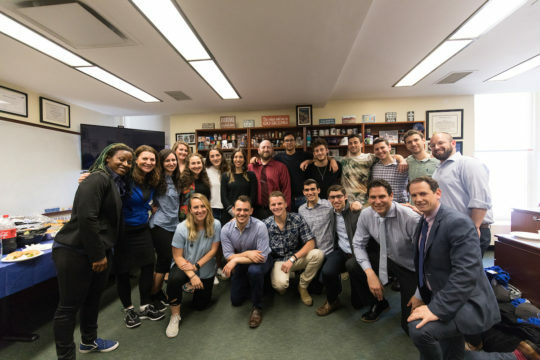 History will be made on Thursday, as the Yeshiva University men’s and women’s tennis programs will be competing in the NCAA Division III tournament at the same time. For the first time in program history, the women’s team will be competing in the NCAA championships. The Maccabees (10-3) will battle the nationally-ranked No. 18 Thoroughbreds of Skidmore College (15-5), at the Proctor Tennis Courts, with the start time to be announced. Middlebury College will be hosting the regional, up in Middlebury, Vermont. For the first time in program history, both of YU’s tennis teams will compete in the NCAA Division III tournament. The Yeshiva University men’s tennis team will be competing in the NCAA Division III tournament for the fifth year in a row. The Maccabees (13-5) will battle the Roadrunners of Ramapo College (11-5), in a rematch of last year’s NCAA tournament first-round matchup. The match will take place at regional host Bowdoin College, up in Brunswick, Maine, on Thursday beginning at 11:00 a.m. The women’s tennis team will be the first women’s program in school history to compete in the NCAA postseason tournament. The Maccabees earned the automatic bid by winning their first Skyline Conference championship since 1999. Yeshiva defeated Mount Saint Mary College for the conference title, 5-1. Skidmore is no stranger to winning conference championships or competing in the NCAA tournament. The Thoroughbreds have won eight consecutive Liberty League tournament championships. Last season, Skidmore defeated Elizabethtown College in the first round of the NCAA tournament, 5-0, before being eliminated by Amherst in the second round. Leading the way for Yeshiva will be senior Shani Hava. The two-time Skyline Player of the Year was named the Most Outstanding Player of the conference championships. She is 31-3 in her career at No. 1 singles. Hava has also been named to the Skyline All-Conference first team all four years of her illustrious collegiate career. The Petach Tikva native won both #1 singles flights and both #1 doubles positions in the Skyline championships, on her way to leading her team to the conference title. Junior Rebecca Packer was named to the Skyline All-Conference first team for the second year in a row. 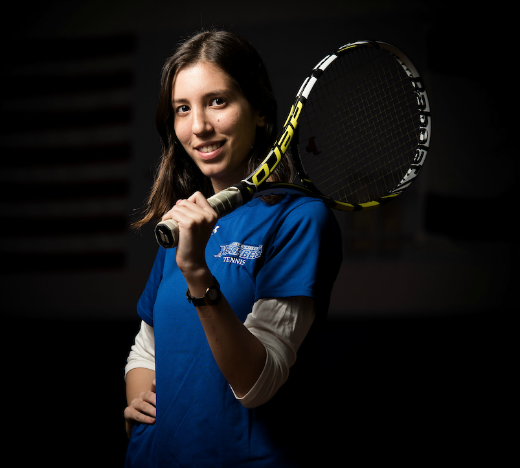 The Teaneck resident won all six of her Skyline doubles matches, all in the #1 position, during the regular season. Her 6-0 singles record was the best in the conference. She teamed with Hava to win every game in the first doubles position in the semifinal match against Purchase. She earned wins in the first doubles position and at #3 singles in the championship match against Mount Saint Mary. Yeshiva University head coach Naomi Kaszovitz was named the Skyline Coach of the Year for the second time in her career (2014 and 2017). On the men’s side, The Maccabees won last year’s thrilling head-to-head matchup, 5-3, to earn a spot in the second round of the NCAA tournament. These two teams met once again in this year’s season opener, back in the fall. This time, it was Ramapo that came out victorious, 6-3, at the Ramapo Athletic Center, on October 25. The winner of Thursday’s match will take on nationally-ranked No. 3 Bowdoin in the second round, on Friday morning. The Maccabees earned their way into the Big Dance by receiving an automatic bid, thanks to winning the Skyline Conference championship for the fifth year in a row. Yeshiva defeated the United States Merchant Marine Academy, 5-0, to capture the conference title. Ramapo also received an automatic bid into the NCAA tournament, as the Roadrunners captured its sixth consecutive Great Northeast Athletic Conference championship. Ramapo defeated Regis College, 5-1, in the championship match. Leading the way for the Maccabeees has been junior Adam Rosemblaum, who was named the Most Outstanding Player of the Skyline Conference championships. He also earned a spot on the Skyline All-Conference first team. In the championship match against Merchant Marine, Rosemblaum was victorious in the first doubles position, 8-4, and cruised to a win at the first singles flight, 6-0, 6-1. That propelled Yeshiva to its fifth straight Skyline championship and an automatic bid into the NCAA tournament. Rosemblaum went 5-1 in Skyline singles matches during the regular season, all at the No. 1 position. He also went 5-1 in No. 1 Skyline doubles matches. Junior Mikey Ozery was also recognized as a Skyline All-Conference first team member. He went unbeaten in Skyline singles play, with three out of his four victories coming in the second flight. Ozery won four out of five conference doubles contests. In the semifinal match against Farmingdale, Ozery won at #2 doubles, 8-1, and at #1 singles, 6-1, 6-1. In the championship match against USMMA, Ozery won the second doubles flight by a score of 8-4. The full NCAA Division III Women’s Tennis tournament bracket can be seen here. The full bracket of the NCAA Division III Men’s Tennis championships can be viewed here.